Cabo Fort was built in 1540 A.D. on the south headland of the river Mandovi in Goa. The word Cabo literally means cape in Portuguese. 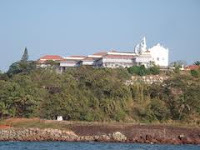 The Cabo Chapel in the modern times is also known as the Cabo Fort, Cabo Palace, Cabo Raj Niwas and even Raj Bhavan. as a landmark for the seafarers in the ancient days. The Cabo Palace is now known as the Raj Bahavan, the official residence of the Governor of Goa. Bohemian Chandeliers, Chinese porcelain, silver and wooden furniture are extensively used for ornamentation of the place. The area in the Raj Bahvan that is used for the swearing ceremonies and other official occasions is called as the Darbar Hall. The Cabo Chapel Fort in the beach paradise is a place that is not to be missed when in Goa.